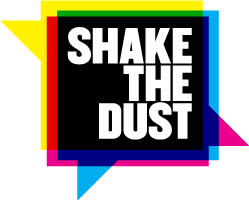 just—some stuff: Shaking that Dust. It's very exciting to be reaching the end of this project and being able to see our Slammin' Saints onstage. It feels like Alfie and I have been resident poets at the school for aaages, and it's been really good fun working with the teachers and a fabulous bunch of young people who seem to have got a lot out of writing and performing their work. I can't say I'll miss the 5.30am starts all that much, but it will be weird not to be thinking about delivering workshops and playing Giants, Wizards and Elves. I've really learnt a helluva lot when it comes to working in schools - not least that you can't underestimate how important it is to have teachers working with you who are as fired up about the work as you are - and I'll certainly be incorporating more of a performance aspect to my own work, both creatively and in an educational way. Getting people up and moving about is a great way to keep the imagination fired, and to get reluctant writers to realise that poetry is fun. Because it is, you know. Really good fun.